FThis colt is a half brother to our own MASTERBRAX (x EUROZONE)! Star Witness x unopologetic colt pre trainers from Dalziel Racing on Vimeo. 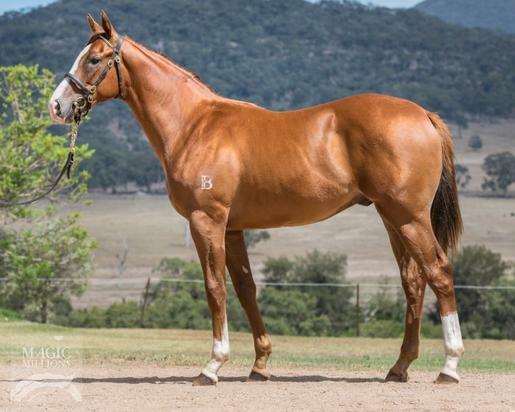 Lot 415 MM 2018 - Star Witness x Unapolgetic Colt FINAL PDS from Dalziel Racing on Vimeo. STAR WITNESS (AUS) (Chestnut 2007-Stud 2011). 4 wins-3 at 2, VRC Coolmore Stud S., Gr.1. Sire of 334 rnrs, 194 wnrs, 14 SW, inc. Global Glamour (ATC Flight S., Gr.1), Star Turn, Mella Maria, Fuhryk, Graff, Crown Witness, Stellar Collision, Our Crown Mistress, Lord Balmoral, Lycurgus, Magic Alibi, Pearl Star, The Barrister - High Volatility (H.K. ), Well Sprung, SP Kimberley Star, Serenade, Berkshire Lady, She's Our Star, Alta Stella, etc. Masterbrax (g. by Eurozone). Winner at 1200m in 2018-19 in Aust. Power of Patch. 2 wins at 1400m, 1600m to 2016-17, BOP RC Michael Stemmer Barrister H., 2d ATC Australian Flying Corps H., 3d ATC Tab.com.au H., ARC New Zealand Herald H.
Dralion. Winner at 1400m, 2d STC Freeway Hotel Super TAB H.
Modena Creation. 6 wins at 1350m in Macau. Herecomes Thefuzz. 2 wins at 1300m, 1400m in 2017-18 in Aust. Zumanity (O'Reilly). 3 wins. See above. Bally Duff - Roma Thunder (H.K.) (O'Reilly). Winner at 2100m, 2d ARC Great Northern Foal S., L, HKJC Franck Muller H., 3d HKJC Beas River Country Club H., Vacheron Constantin H.